Hawker Motorcycle agent F.W. Lomas of Swift's Row Garage. Homepage. This page: An illustrated letterhead for this Carlisle-based motor-car & Hawker motor-cycle garage. F.W. Lomas - Swift's Row Garage. The date on this old garage letterhead is November 8th, 1922. The handwritten note confirms that Mr F.W. Lomas, Cycle, Motor and Machinery Engineer operating out of Swift's Row Garage in Carlisle, agreed to pay off a debt of £25, starting with a downpayment of £5, followed by quarterly payments. An illustration of a vintage motor-car, complete with driver, appears at the top of the letterheading, although unlike on many similar garage-related items like this, there is no mention of hire cars being available from Swift's Row Garage. They could however supply motor accessories, petrol and oils, and an interesting range of motorcycles of which more below. 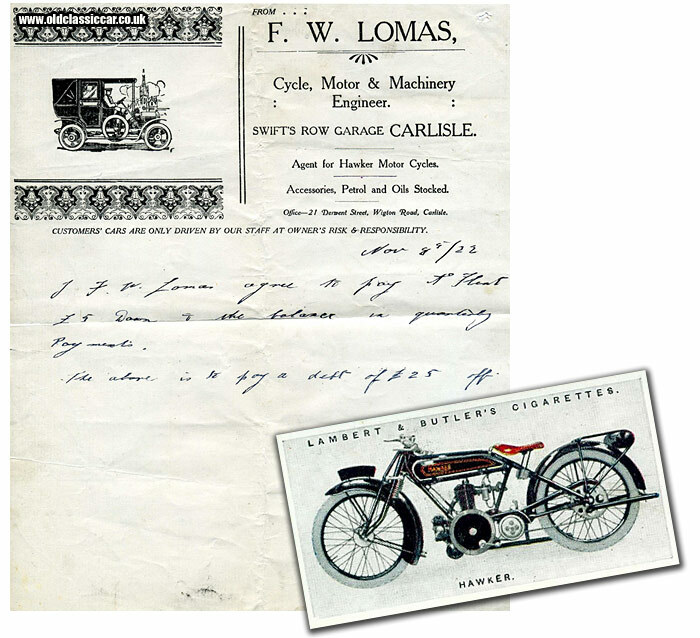 Scan of the Lomas garage letterheading, accompanied by an old cigarette card featuring a vintage Hawker motorcycle of the early 1920s. Of most interest perhaps is the mention of the garage being an agent for Hawker Motor Cycles. Production of the Hawker machines began in 1920 and only continued until 1924. These machines were the brainchild of Harry Hawker and Tom Sopwith, both pioneer aviators. Hawker was born in Victoria, Australia, in 1889 before moving to England in 1912. Here he worked at the Brooklands Aerodrome, becoming test pilot for Tom Sopwith, of The Sopwith Aviation Company. Following WW1, and the closure of his business, he and Harry Hawker formed H. G. Hawker Engineering, later becoming Hawker Aircraft Limited in 1933. The first Hawker motorcycle, a 292cc two-stroke with belt drive - the Model A - was announced late in 1920, the plan being to sell their motorcycles via Jarvis Ltd, a motor dealer situated on the Edgware Road in London. Towards the end of 1921, three more models were introduced - a 348cc, a 545cc sidevalve, and a 348cc OHV, all powered by Blackburne-sourced engines and featuring chain drive. Production of all four models continued through 1922/1923, although a 249cc OHV machine was added to the range. 1924 would be the final year of production for Hawker motorcycles, the range by now only consisting of the four-stroke motorcycles. The company's efforts would now concentrate on aircraft production. In all, approximately 200 two-strokes and less than 100 four-strokes are believed to have been built by Hawker, with survivors being very few and far between today. I wonder how many, if any, were sold via F.W. Lomas' garage in Carlisle? More items of paperwork relating to vintage motoring and garage services can be found in the Motoring Collectables section.